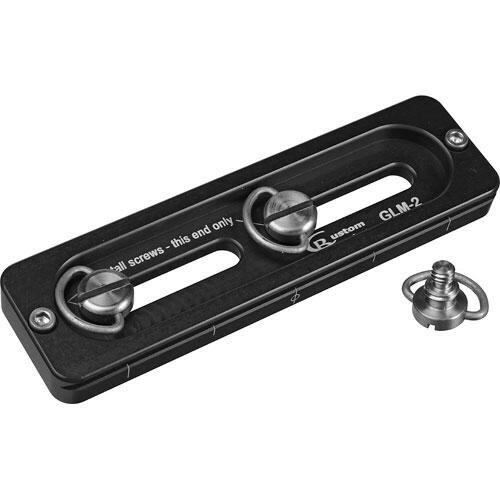 The Custom Brackets GLM 5.5 Quick Release Plate is a 5.5" long Arca-type compatible plate that is ideal for use with 300mm or 400mm telephoto lenses. It can be attached to the tripod collar's foot, and can be adjusted to achieve balance when using a gimbal head. It can also be attached directly to a camera's tripod mount for applications where a longer plate is needed, such as when small adjustments are needed when shooting macro photography. The plate is supplied with 3 D-ring mounting screws for easy attachment. Box Dimensions (LxWxH) 5.5 x 1.5 x 0.5"
GLM 5.5 Quick Release Plate is rated 4.5 out of 5 by 4. Rated 3 out of 5 by Paula from Not for heavy gear. The plate is easy to attach to camera body or lens foot. For lightweight gear I suppose this holds well. When attached to a Canon 300mm 2.8 which is on a Canon 1dx body the plate does not hold securely. There definitely needs to be some sort of traction on the top of this plate. Once I mounted the plate to the lens foot and attached it to my Jobu jr3 gimbal head the entire setup did not hold solid. Everything began to twist and felt unstable. I was looking for something to use for astrophotography. The 5.5 length is a bit short to allow for this combination setup to tilt upwards enough for overhead shots. This might work better with the lens attached to my 5diii body. I am going to get a 6.5 inch plate with some anti twisting traction to hold the setup securely. Rated 5 out of 5 by Adam from High quality Very high quality, light weight lens plate. The mount screws are very well made and easy to tighten by hand. Rated 5 out of 5 by Level-headed_guy from Beautifully machined When I received this lens plate I expected just another lens plate. What I received was a piece art that is used for a lens plate. I was amazed at it's lightness and functionality as it is machined with the Arca-Swiss groves on both top and bottom. But this is what I have come to expect from Custom Brackets. Yes they are towards the top end pricing wise, but what you get is a functional Work of Art! Rated 5 out of 5 by Anonymous from Well made plate This lens plate is well made. I also like the bails on the screws which allow you to tighten by fingertip and then fold the bails down.